We arrive at centre at 9am and our first priority is to settle our children. As a team we set up areas of play based on the children’s interests and play alongside them to help them learn and discover more about their world. We have a shared morning tea at about 10.15am and we share news, read stories and socialise with each other. After morning tea we continue with our activities, and usually have something different planned for the children to focus on if they wish. At the end of our playing session (11.45am) we have a group evaluation, where we sit together with our lunch boxes and discuss the day; what went well, what we would like to work on and planning for next week’s session. Then it’s all hands on deck for a clean up and we encourage the children who can to help also. We have such fun together; learning new things and developing relationships with one another. We welcome you to visit our centre and join us. Please contact us on 09 6349141. 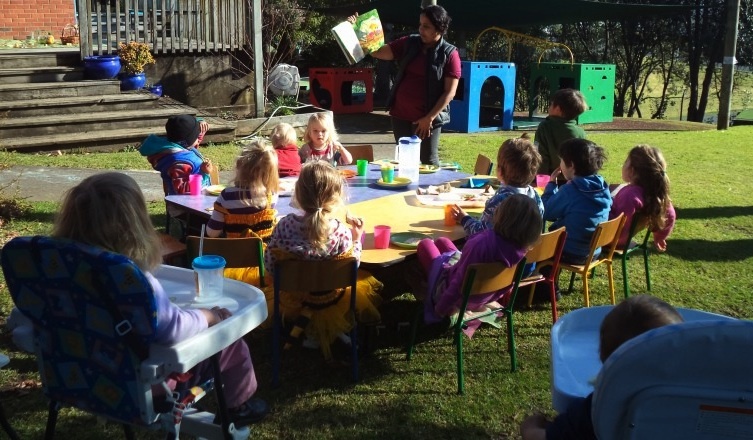 Children listen to a story while eating Morning Tea outside on a sunny day!